Many people prefer to buy gas space or water heaters when it comes to reliable and cost-effective heating system for a house. Despite constantly increasing natural gas prices, these systems are still considered the most convenient, safe and affordable for most U.S. homeowners. However, like any appliance using natural gas as a power source such type of heating system requires following of certain safety rules. All homeowners using gas heaters should keep in mind that these systems need to be looked after by qualified specialists. Improper usage of has heating systems may easily cause such terrible health problems as carbon monoxide poisoning. If someone of house’s inhabitants has such symptoms as shortness of breath, dizziness, headaches, chest pain or nausea, there is a chance of gas poisoning. In this case, immediately turn off a gas heater and seek a medical assistance. To prevent such scenario it is important to make sure gas heaters are installed properly before starting to use them. Do not save money on a gas-heating specialist. An unsafe (i.e. unprofessionally installed) gas heater can cause a fire or severe pollution with poisoning fumes. 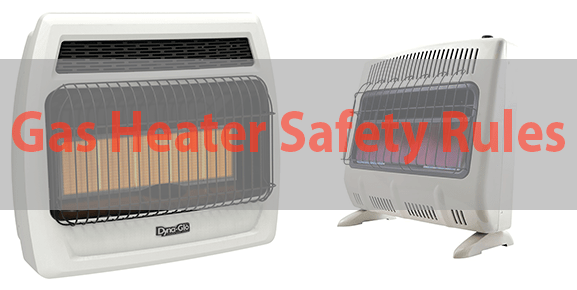 When buying a gas heater it is advised to pay attention to the following safety rules. Natural gas heaters cannot be used in enclosed spaces. They must be installed horizontally on a firm, smooth and stable ground or flooring, protected from wind and other weather conditions. Open-air gas heaters should be protected from direct sunlight. Do not store a fuel tank with natural gas in a basement or any unventilated areas. If you feel the smell coming from the heater gas, immediately shut off the faucet and open all windows in a room. Repair and maintenance of gas heaters can only be provided by experts from the certified service centers. Gas heater should be inspected every 2 years by qualified specialists. Soot stains form around a heater. If there are any of these signs were noticed, try to replace the old gas heater as soon as possible. Owners of timely replaced gas heaters enjoy a quieter operation of new models and a better safety system preventing release of poisoning fumes. Try to buy new gas heaters with the in-built sensor monitors capable to measure the level of oxygen in the room.